I agree ‘BS’ are disgusting but those Andy Griffith books are pretty funny. They got my non reader reading and even now he will pick them up to read again. He still doesn’t read much 😉 sadly can’t convince him what he is missing out on. 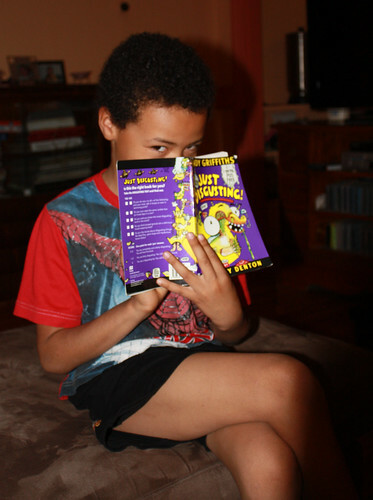 My youngest has inhaled all of those Andy Griffith books… and it led him to an absolute love of reading. The next series he adored was the “Cherub” series… but be warned, book 12 contains some sexual stuff that i considered so inappropriate that I glued the pages together!! Feral Beast loves Andy Griffith! My dd’s teacher read this series to them and really inspired a lot of spin off reading – definitely hits that age groups funny bones. Oh – and I don’t like Brussel Sprouts, although there are rumours my SIL has a recipe that makes them edible. I have heard of these books and how popular they are with the young kids set…kids always love this type of stuff! Yep, all of the above – including the brussles sprouts – apply here too! I guess since I don’t have any young kids anymore, I’m not familiar with the Andy Griffith books; but my daughter Jen might be…being a teacher. I just loved when my kids wanted to read to me…I could listen forever. I miss that. I hope I get to hear Bella and Bastian…they’re starting to do that at home sometimes. And honestly, what normal kid really likes brussel sprouts? A lot of adults don’t even like them.